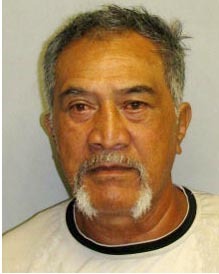 Big Island police have charged a 63-year-old Hilo man in connection with a confrontation Friday (July 13) in Hilo. The charges stemmed from a report police received at approximately 6:20 a.m. Friday. Officers responded to home off Kūkūau Street after a 50-year-old Hilo man reported that he had been assaulted following a dispute. The suspect allegedly entered the victim’s home and while inside, allegedly assaulted the victim and a 21-year-old Hilo man. Neither victim sustained any injuries during the confrontation. At 9 p.m. Friday, detectives from the Area I Criminal Investigations Section, after conferring with prosecutors, charged Joseph Werner Leong with one count of first-degree burglary, one count of first-degree terroristic threatening, and two counts of harassment. Leong was released from police custody after posting $5,500 bail.